Congratulations, you have created your LifeBadge. Print this page before returning to the site to begin and to input your information. Cut out the image of the card at the top of the page, write your name there if you like and put it in your wallet close to your identity card. Thus, even in cases of unconsciousness, emergency personnel will be able to easily find your LIFEBADGE. When you create your LifeBadge site for the first time, you must define a secret code. Write it down carefully because you must use it each time you want to modify information for your LifeBadge. 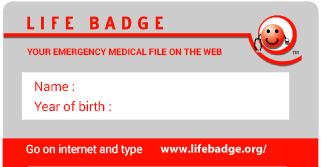 Also write down the 23-digit number of your LifeBadge card: this is the only way to access your LifeBadge site and, if you lose it, you must create a new card and encode all of your information again.